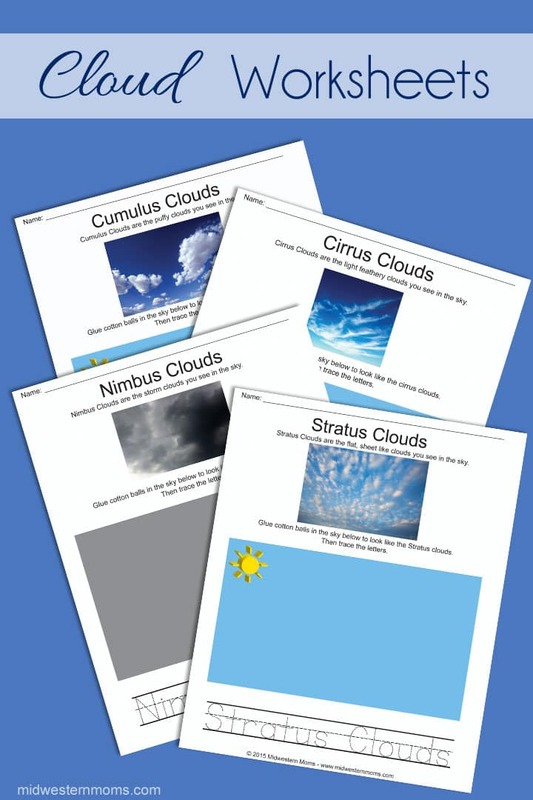 “Mom, What type of clouds are those?” This simple question is the motivation behind making these fun cloud worksheets. At first, I told my son that we could look up the answer on the computer. I did find a write up about clouds so I tried to explain them to him. He loved learning about the four types of clouds but I thought a fun worksheet would be the best thing to help explain them better. So I put him down for his nap and told him I would have something fun for him when he woke up. Since my son is three, I decided to incorporate some of the things he has been learning. For example, writing his name and tracing the letters. He really loved working on these. It was a fun change from his workbooks and since he has a brain for science, it was right up his ally. He was so proud of his worksheets that they were taken to Grandma and Grandpa’s house to hang on the fridge. 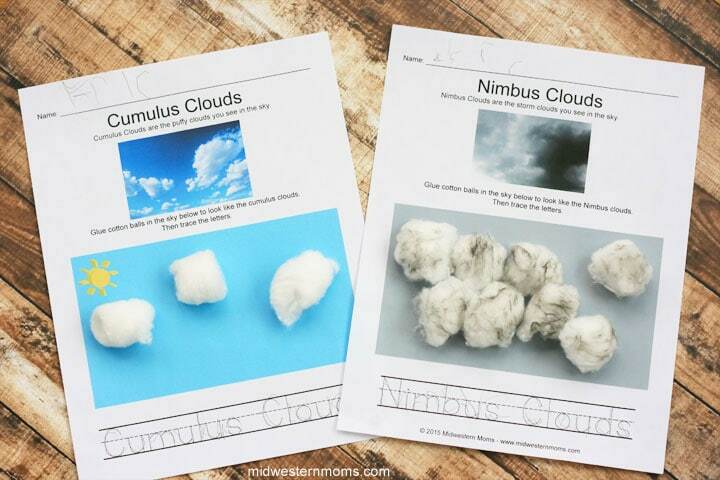 When worked on worksheets, was discussed each type of cloud. Then we decided how to glue to cotton balls onto the paper to make it look like the photo. Once that was done, he traced the letters and I read what he traced. I know some of the information has stayed with him. He recently went into our sunroom and said it wasn’t going to rain because there were no nimbus clouds. To give the Nimbus Clouds their dark color, we rubbed a black crayon on them. The Cirrus Clouds we pulled apart the cotton balls to make them wispy. 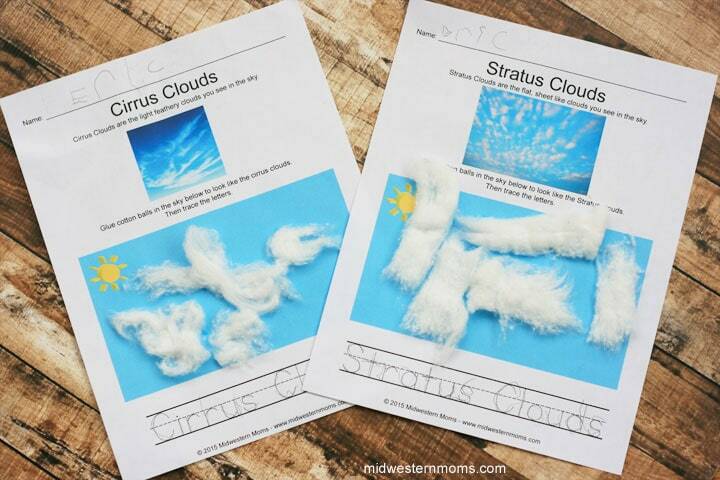 For the Stratus Clouds, we unrolled the cotton balls and made them into sections. Enter your information below to snag these free cloud worksheets. An email will be sent to you with a link to download and print the pages. Do your kids like working on worksheets or workbooks? What topics are their favorite to learn about? You should be a preschool teacher! Not only did you teach him something, you made it fun! These are fantastic! I am pinning them now so that I can print them for my own four year old. Thank you so much for sharing at the Home Matters Party. Join us again next Friday! The Door Opens at 12am EST. Great idea. I was just talking about types of clouds with my daughter the other day! My daughter printed these off for my four year old grandson and he had so much fun with it. Also he had given them to Papa and I to display on our refrigerator. He can tell us what each one of them are. Thank you! I haven’t any kids at home, but these are ideal in helping me learn the names of the clouds I photograph.